If you’re searching for trailer hitches or trailer hitch installation near me in: Phoenix, Mesa, Chandler, Scottsdale, Glendale, Gilbert, or Tempe; Cliffs Welding can help! We sell and install the highest quality trailer hitches, weight distribution hitches, 5th wheel hitches, gooseneck hitches, along with other types of trailer towing accessories you need for your truck. Cliffs Welding has specialized in trailer hitch installation and towing accessories for the Phoenix Valley since 1964. We have a wide selection of brands and styles to fit every towing need. Installation is done at our shop in Mesa or we offer mobile welding services. Cliff’s Welding is an official installer of the following styles and brands of hitches. By far the most common type of truck towing necessity, and not all trucks are sold with one. Cliff’s can install the hitch receiver and get you a stinger so you can handle all of your towing needs that require a ball hitch. Gooseneck hitches are the serious towing and trailering choice. Many agricultural trailers and livestock trailers utilize this type of hitch to help distribute the weight of the trailer between both axles of the vehicle. This also allows the overall weight of the trailer to be considerably higher than simply hooking up a ball hitch at the rear of your truck. Weight distribution hitches help maximize the weight you can carry on a standards rear hitch. They help compensate for sag at the rear of the truck which improves handling, steering, braking, and can help alleviate sway control. The open road is full of freedom from the routine. But safety and secure fifth wheel towing is part of making the trip fun and safe. 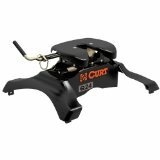 Curt Fifth Wheel Hitches help you get the job done and take the stress out of towing. 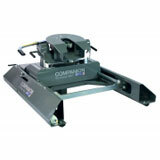 Companion Sliders are Fifth Wheel Hitch Accessories which make it possible to move the point of the hitch. Moving the hitch point allows for greater maneuverability. The slider is removable so your truck bed is clear when you are not towing. 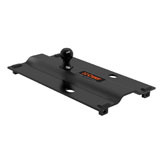 Front Mounted Hitches are ideal for the tow vehicles we love to take with us on the road. When we are visiting certain cities, towns, or trails it is best not to have to drive down these narrow roads with our trailer or RV’s. Front mounted hitches are installed on your tow vehicle to make hooking them up a snap. We install trailer hitches, repair trailer hitches, and replace trailer hitches for both commercial trailers and recreational trailers. That means our Mesa based shop can service trailers for both your personal and commercial use. We install trailer hitches from all of the top brands such as: Curt, B&S Trailer Hitches, PullRite, REESE, and Roadmaster. When you need a rock solid platform to get the job done, Cliff’s Welding is your source for the best trailer hitches and unmatched installation. The classes of trailer hitches are a reference for how much weight they can handle. Knowing how much your trailer weights, knowing what your vehicle can tow, and having the right trailer hitch can mean the difference between trouble free towing, and potentially scary highway experiences. Having the professionals handle the welding and installation helps ensure that you’ve got a solid trailer hitch platform. When out shopping for a trailer hitch, you may be overwhelmed by the sheer number of options available and choosing the right one may seem like a daunting task. It really isn’t, as a simple assessment of the kind of vehicle you have and the kind of trailer you’ll be attaching to it will reveal what kind of hitch you need to purchase. Below, we have detailed the different types of hitches that are in the market along with their features, and the benefits of choosing them. Of all the different trailer hitches, the receiver hitch is probably the one most commonly used. It is designed so that it mounts on the frame of your vehicle and, depending on the kind of receiver hitch it is, provides an opening or a receptacle the shaft of a ball mount or other inserts can go in. A lot of these hitches will be vehicle-specific and made to fit vehicles of a particular make and model, or a series of models. Depending on the size of the receiver tube and the weight capacity, manufacturers classify them in 5 different classes, which we have outlined below. However, it should be noted that all hitches are not rated at a uniform capacity and they won’t change the maximum load a vehicle is able to tow. Very much like Class 1 hitches, these have a receiver tube opening 1 ¼ inch x 1 ¼ inch in size and a maximum weight capacity of 3,500lbs (GTW). These are used for lightweight towing and are similar to Class 1 hitches, except for the fact that they can tow a larger load. The max weight limit of 3,500lbs, however, is not consistent for every model and may differ. These hitches are most popular with minivan, crossover and full-sized sedan owners, but are also used with small pick-up trucks and SUVs. Having a 2 inch x 2 inch tube opening and a max load capacity of around 8,000lbs, Class 3 hitches are most popularly used with full-sized SUVs and pickup trucks. Some may also be used in coordination with a weight distribution hitch.Chances are that your full-sized pickup truck will already have a Class 3 hitch if it came with a towing prep package. What differentiates them from Class 1 and Class 2 hitches, apart from their increased load towing capacity, is their ability to be used with a weight distribution hitch to offer max weight towing capacities of around 12,000lbs (GTW). Class 5 receiver hitches can be bought in a 2 inch x 2 inch, or a 2 ½ inch x 2 ½ inch tube opening, and have the highest load towing capacity out of all the other receiver hitches, going up to 18,000lbs – 20,000lbs. 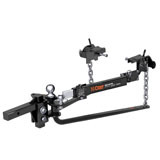 Like the previous two, they can also be used with a weight distribution system, although, with weight capacity already so high, the addition of a weight distribution hitch doesn’t increase the load capacity by much. However, it does help stabilize the vehicle and the trailer. This kind of a hitch will normally be used with commercial and full-size pickup trucks. It is advisable to purchase a hitch that exceeds or, at the very least, matches your truck or car’s maximum towing capacity, even if you don’t intend to tow it at full capacity right now, as you may have to at a later stage. Apart from the 5 classes we discussed above, there are other more specialized receiver hitches as well, that are widely used for towing purposes today. These hitches have a 2 inch x 2 inch tube opening, and because they need to be attached to the vehicle’s bumper, the maximum weight they can tow is limited to and determined by the vehicle’s bumper, rather than the vehicle’s overall capacity. They are generally employed for light duty towing. You’ll commonly find them being used with SUVs, pickup trucks and similar large vehicles. Used with certain van, truck and SUV models, front mount hitches come with a 2 inch x 2 inch tube opening and a load carrying limit of 5,000lbs (GTW). This kind of hitch enables you to put a cargo carrier in front of the vehicle, giving you free space at the back of the vehicle for other towing applications. These hitches have often been used to launch boats or to park trailers in tight spaces as they give you better control over the trailer. They can also be used for attaching snow plows, skid shields, a spare tire mount, and other utilities. We have had a look at different types and classes of receiver hitches so far, but there are other types of towing hitches too that aren’t receiver hitches. Some less common towing methods employed mainly for heavy-load towing applications are outlined below. These do exactly what the name suggests, and that is, distributing the weight of the tongue over the trailer and towing vehicle. Weight distribution hitches are receiver hitch attachments and can be inserted into the tube opening of class 3, 4 and 5 hitches like a ball mount, using an adjustable shank. Their specific purpose is to spread the trailer’s tongue weight over all the available axles. Weight distribution hitches use spring bars, which are long rod-like structures, to distribute a part of the tongue weight over the vehicle’s and trailer’s axles. If they are not used, heavy loads can unload the front tires of the vehicle, causing steering sensitivity to deteriorate. Some of the newer and advanced models of the WDH can also limit nonessential lateral motion by employing trailer sway control. 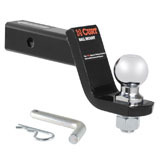 These are heavy-duty hitches that can be used with pickup trucks only. With a maximum towing capacity of 16,000lbs – 25,000lbs, these hitches are normally used for towing immensely heavy loads like large campers and car haulers. The hitch is normally mounted over or in front of the rear axle, and has a design very similar to commercial rigs. Many models of the 5th wheel hitch have the capability to absorb minor bumps on the road, and are the only kind of hitch in which the coupling mechanism is not a part of the trailer, but the hitch itself. Similar to 5th wheel hitches, this type of hitch mounts onto the bed of the truck and has a max capacity of 30,000lbs (GTW). Suitable only for pickup trucks, gooseneck hitches place the tongue weight of the trailer slightly in front of the truck’s rear axle. Designed for ease of access, these are not as intrusive as 5th wheel hitches, and allow access to the bed of the vehicle when the trailer is not hitched. These hitches can often be seen used in animal trailers transporting horses and other livestock, car haulers, and commercial trailers and flatbeds. This is a rather simple but strong hook-and-loop hitching mechanism, made up of a lunette eye secured onto the trailer and a pintle hook mounted on the vehicle, with a maximum towing capacity of 60,000lbs. It should be noted that this will vary from model to model and will also be determined by the type of vehicle. 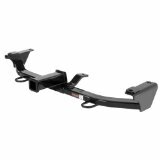 Equipped with a general understanding of the different kinds of hitching mechanisms, you may now be starting to get an idea of which trailer hitch will suit your needs and will work well with your vehicle and trailer, so you need not be at a loss for direction when you go shopping for one. *With our large back lot and multiple service bays, we can accommodate any size vehicle or RV for customized service. Cliff’s Welding is proud to help Phoenix Valley residents find the best fit for trailer hitches of all kinds and provide rock solid reliable installation. When you’re towing you can count on the quality of the parts we sell and the best installation and welding service anywhere. For more information about the brands, styles, and types of trailer hitches we carry stop by our shop in Mesa or give us a call at 480-832-0570. Cliff's Welding sells and installs the highest quality trailer hitch and tow bars.